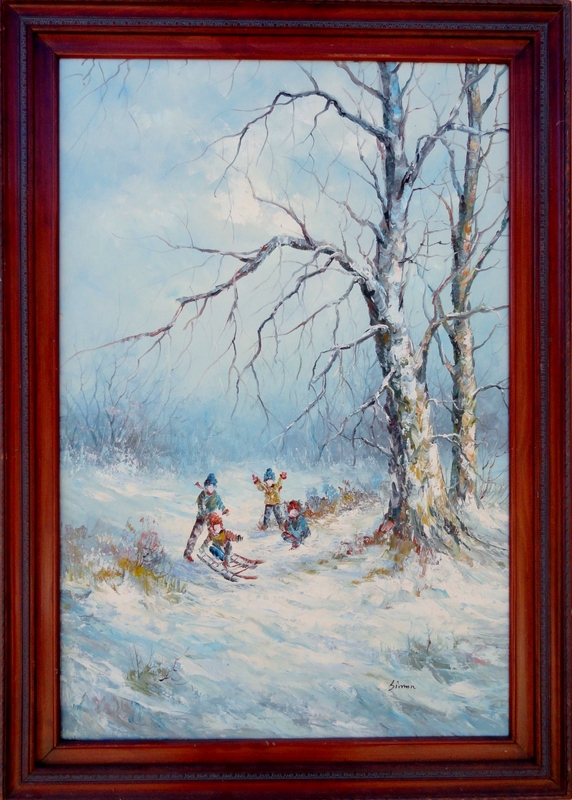 This is a late Mid century painting of children Playing in the Snow, signed Simon. It’s a rather large painting, and I think it was probably created in the late 60’s, early 70’s. I think it captures the memory and the charm of time spent with brothers and sisters, and neighborhood friends, sledding, building snowmen, having snowball fights, and just having fun playing in the snow in winter. Wonderful Christmas memory, too. Something to notice about this painting are the many hidden faces in the trees and bushes, which adds a surreal optical illusion quality to the painting. There’s an old man with a white beard in the trunk of the tree facing in the direction of the children. There are numerous other small faces in the bark of the tree, and the bushes.